Based on the conviction that only translators who write poetry themselves can properly recreate the celebrated Greek tragedies, the Greek Tragedy in New Translation series offers new translations that go beyond the literal meaning of the Greek in order to evoke the poetry of the originals. Under the general editorship of Peter Burian and Alan Shapiro, each volume includes a critical introduction, commentary on the text, full stage directions, and a glossary of the mythical and geographical references in the plays. Brought boldly to life by Herbert Golder and Richard Pevear's translation and contextualized by Herbert Golder's eloquent introduction, this early Sophoclean tragedy tells the story of the Homeric hero better known as Ajax, who was second only to Achilles among the Greek warriors. In Greek tradition, Aias figures as the archaic warrior who dies in shame after his betrayal by the Greeks. Sophocles turns tradition inside out, portraying Aias' suicide not as a disgrace but as heroism. He endows Aias suicide with a meaning radically different from previous versions of the Aias myth--Aias is not the hero whom time has passed by, but rather the man who steps beyond time. Most previous versions and interpretations have equivocated over Sophocles' bold vision. 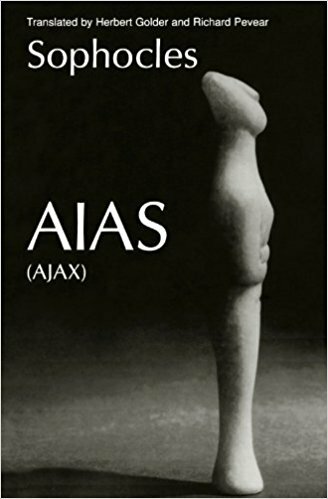 This edition of Aias translates precisely that transformation of the hero from the bygone figure to the man who transcends time.